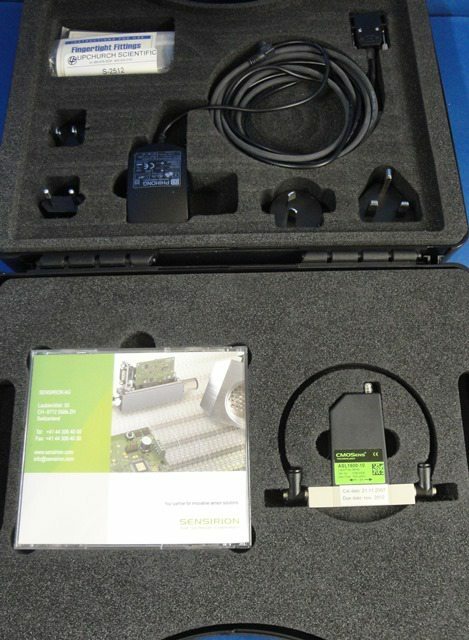 The Sensirion ASL1600-10 is ideal for fast and accurate measurements of ultra low liquid mass flows. Totally non-invasive. Max bidirectional flows up to 1 ml/min; Calibrated minimum Flow 40 µl/min; Resolutions down to 100 nl/min; Response time 30 ms; Pressure Drop at maximum flow <100 Pa; Overpressure Resistance: 5 Bar; Operating Temperature +0…+60°; Bidirectional RS-232 digital interface. Supply and data transfer: 4-pin M8 connector IEC 60947-5-2; Housing of chemically inert PBT. Dimensions: 56x14x69mm. Case and software included.